Smartphones are constantly evolving and improving as developers add more features to impress and entertain users. With all the fun elements our phones have to offer, it’s easy to forget that these devices can also be incredibly useful when it comes to productivity. Thanks to a huge amount of utilities and apps available, your Android smartphone can help you get things done more quickly and efficiently than ever before. 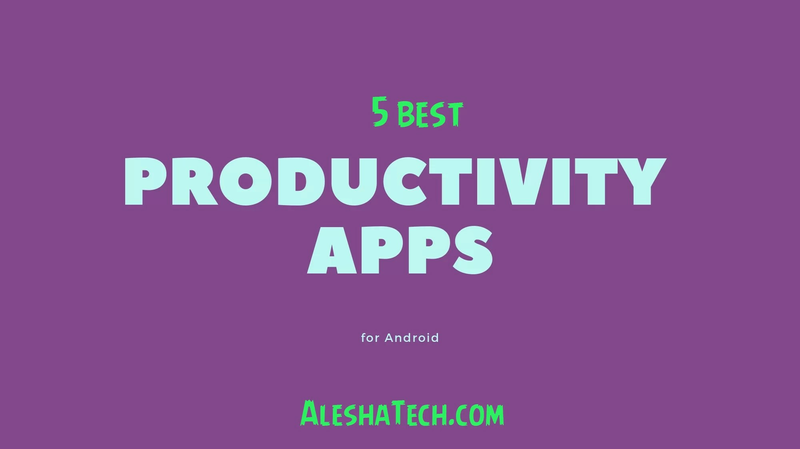 Stop letting your phone distract you from work and start letting it help you by trying out the most highly recommended productivity apps for Android, brought to you by experts at Syntax IT Support London. Isn’t it annoying when an important thought comes to you, only for you to forget about it before you have time to action it? Thanks to Renotify you can record anything important in an instant and be reminded of it until you have time to respond. What makes Renotify different to other notetaking apps is its speed and intuition; upon opening the app the keyboard is ready for you to start typing, so all you have to do is jot down your reminder and press the ‘Create’ button. Once you’ve done this, you’ll see a notification bar with your note at the top of every screen which will stay there until you’re ready to swipe it away. You never have to forget anything again! Stay on top of your to-do list with Trello by sorting tasks into categories. An itemised approach may be just what you need to feel ready to tackle the first items on your list as your workload appears manageable rather than overwhelming. Trello’s interface makes use of easy to read cards which can be sorted into three main categories: ‘To Do’, ‘Doing’ and ‘Done’. Add items to the first category throughout the day and simply swipe them into the next section once you begin work on them. As you make your way through your to-dos and swipe them into the ‘Done’ section, you can monitor the progress you’ve made for that all important sense of accomplishment. CamScanner is an incredibly useful mobile tool, providing an easy way to convert physical documents into manageable digital files. The app’s premise is simple: just capture a photograph of the original document and allow CamScanner to automatically crop and convert the image into a PDF file. Once converted, you can even run a character recognition analysis, which allows you to search for specific terms within the document from PDF readers. Sometimes we need to create and edit documents from our phones, but many of the office apps currently available on Android simply don’t contain all the features we need alongside a simplistic and easy to use interface. WPS Office provides a handy alternative to other apps out there, with a host of features for users packed into an astonishing total app size of only 25 MB. The app is compatible with Microsoft Word, PowerPoint and Excel formats as well as PDFs, making it the most useful mobile documents app we’ve come across. A full range of editing features means you can make changes to documents without the need for a computer. Forest is a unique productivity app that aims to prevent distractions caused by smartphone usage. If you’re getting distracted by your phone and know you should be getting on with something else, try opening Forest and setting a timer. During the amount of time you’ve set, a virtual tree will start to grow onscreen and will only reach maturity if you leave the app open in the foreground for the duration of the timer. The screen can be either on or off, but closing the app to do something else on your phone will cause the tree to die. If you successfully reach your goal without getting distracted by your smartphone, the fully-grown tree will be permanently planted in a virtual forest to remind you of your accomplishment. It may seem like a strange incentive, but it really works.